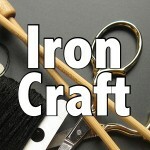 This time around on Iron Craft, we asked everyone to make projects using denim. For me, it was a good excuse to go through all the old pairs of jeans crowding my drawers. Most will go to charity, but I chose a pair with some holes worn right through to use for the challenge. I struggled with what to make when Matt suggested I make a bag to hang on the armrest of the couch to hold all my little crafting supplies. (I guess he was tired of various needles, threads and scissors all over the coffee table.) So, to the sewing machine I went. 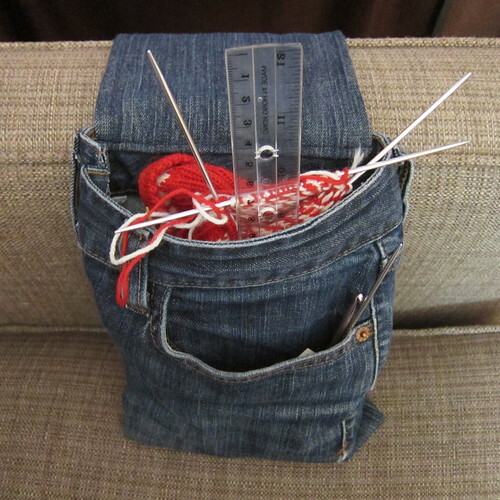 An old pair of jeans makes this a really easy project because it already has pockets build right in. So, all it takes to make this is a few cuts and a few straight seams. Matt is happy stuff is put away and I’m happy I actually can find everything I need easily. It’s the perfect size for my current mitten project in the main pocket while the front and back pocket hold embroidery scissors, extra needles and such. 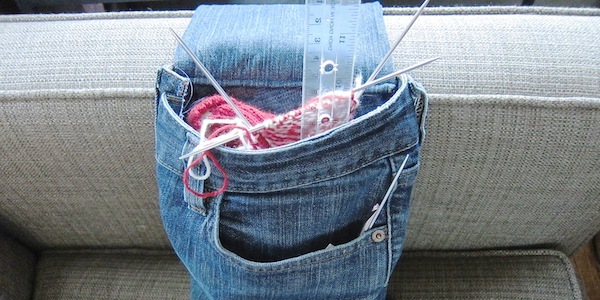 I also like that I’ll be able to keep sewing needles handy by weaving them through the denim. I do want to go back and add a weight to the piece that hangs over the armrest, so it can hang on the outside without falling off when I want it out of the way. 1. Lay your jeans out flat. 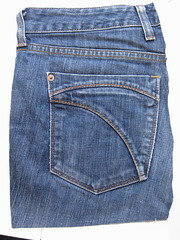 Cut down from the top next to the zipper until about 1″ – 1 1/2″ lower than the back pocket. Then cut across to make a rectangle. Here is my piece seen from the front and back. I needed to square it a bit after cutting. 2. Fold so the right sides are together. Sew the bottom and sides seams together. Seam allowance is really up to you, but I used a 5/8″ and then trimmed it afterwards. Turn right side out. 3. 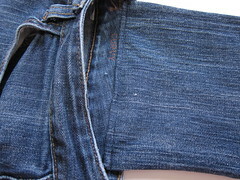 Cut a length of one leg long enough to go over the arm of the chair or couch where you work plus six inches or so more. I kept the bottom hem of the leg intact. Cut the leg open along one side seam. Fold in half with right sides together. Sew into a tube that fits inside the top opening of the bag you’ve already made. Sew one of the short sides together (if you are using the hemmed bottom, sew the other end together.). Turn right side out. Sew the other short side together. 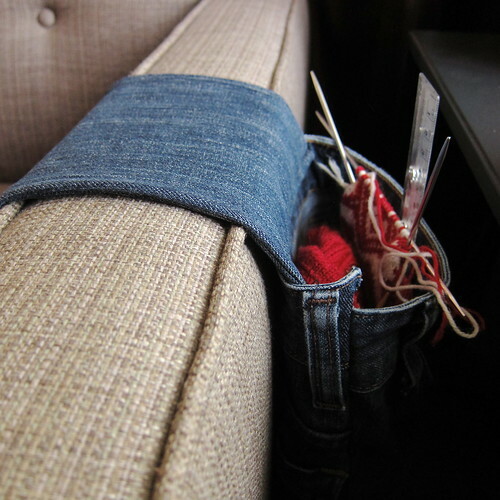 If you want to add a weight to keep your pouch hanging over the outside of your armrest without falling off, sew it in to the bottom of this piece before sewing the last short side together. 4. 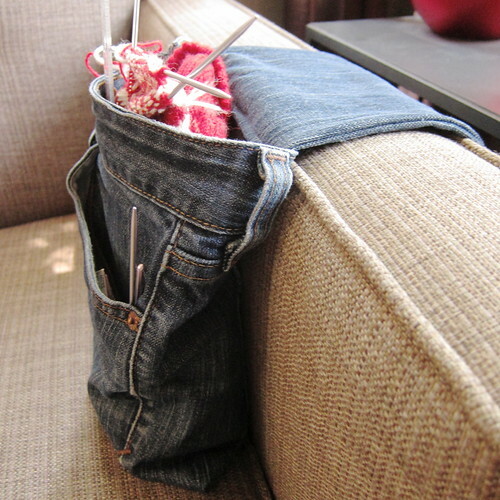 Sew the leg piece into the inside waistband of the bag. Now hang it over your armrest and fill it with all your bits and bobs you need on hand. 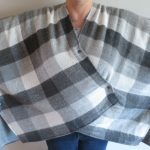 7 years ago by Kat in Challenges , Iron Craft , Needlecraft , Projects , Sewing , Sewing Projects | You can follow any responses to this entry through the RSS feed. You can leave a response, or trackback from your own site. 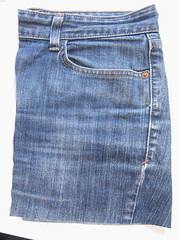 Great way to reuse an old pair of jeans! Love that. I absolutely love this idea! Thanks so much for sharing it. I can’t wait to do one of these. I’m thinking this would make great gifts too, thanks! This would be great to hold the TV remotes too. If you have beige furniture, making this from old Khakis would be cool. Oh yeah, there are lots of way you could weigh it down. Velcro would certainly make it stay in place, though I worry if it would hurt the fabric of my couch. Let us know how it works. If you have the hook side facing away from your couch, and use a loop piece that’s a little wider than the hook piece, you should be safe. Couldn’t you just make two pockets, one on the inside, one on the outside. Each would hold down the other AND you’d have tons of storage. I agree there is no reason you couldn’t adapt this to have two pockets so they hold each other in place. Great idea. Love this! I think I’ll make 2–one for each arm of my lift chair. I can use one for my sewing/crocheting projects and the other for my remote controls, phone, etc. Thanks for the inspirations!!! Great idea. Got few jeans surplus in my craft cupboard. I’m thinking a longer ‘leg’ attached and it can be tucked between the mattress and base of a bed and the bag be used as a book holder for the kids beds. Instead of books strewn all over the bed at the end of the night! I shared this great idea on my blog http://upcy.blog.hu/2015/01/13/hidegben_meleget_407 (it is Hungarian) with a link to here. Thank you! Oh love this!! I need a lid or flap in addition because my lhasapoo destroys my yarn so she can get a cookie to let go. Might even put a zipper on top. Thanks for your genius!! I have so much denim from my son’s worn out pants and I was starting to wonder what else I could do with them when I saw your idea. Can’t wait to make one! I know, you hate to throw it away but you need a good use for it too. You can also tuck it between the mattress and bed frame for pocket to hold your book, etc. 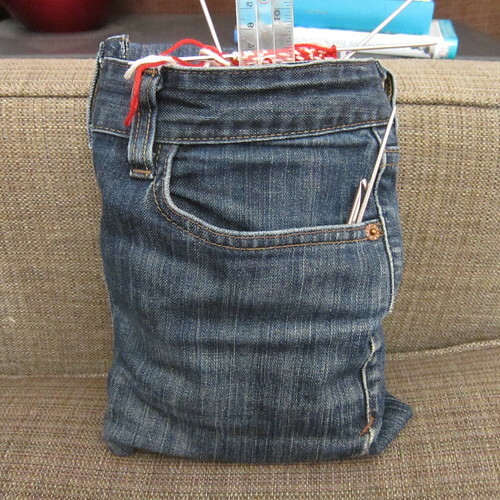 I use jeans for making prizes for fund raisers…purses or backpacks and so many ideas on this site . all lined and useful. Well, one of the very few times that I’m happy my denims are so large! I can probably hold everything for at least a baby afghan. Thanks so much for sharing this great idea. Best yet, I’m in the process of planning to reupholster my chair and couch in denim. I made some little money pouches for the car – parking money etc. Just cut around the pockets of a paid of cords. Did not even have to sew them. I stops the money rattling about, and keeps it together. Just fits the ash tray nicely, which I never use anyway. sorry did not spell check, did in a rush. PAIR of cord, and it stops!!! Why do you always see it after you press enter! This is so perfect!! 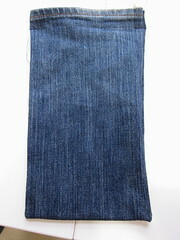 I mostly reuse denim jeans in quilt-making, but this is on the list for the next big pair! I have a lot of my father’s bib overalls and have been looking for the perfect project to use them for. Dad died in 2011 so I have missed him for quite awhile. Perhaps I can make a special project for each of my Dad’s kids, grandkids and great grandkids?